ZIONIST JEWS LOVE TO PLAY UP being victims of Arab suicide bombers. But are there “Jewish suicide bombers?” Indeed there are. One such Jewish “suicide bomber” is the Zionist heroine Hanna Szenes who emigrated to Palestine in 1938 during the founding of the Zionist State of Israel. Every Jewish child in Sabbath school is taught to revere Hannah Szenes. Another Zionist “suicide bomber” is Baruch Goldstein. On Purim morning, February 25 1994, Goldstein walked into a Muslim mosque in Hebron & opened fire killing 29 worshippers. Goldstein knew what he was in for when he sealed the doors before opening fire: a suicide mission for the Zionist cause. For he was soon beaten to death by survivors. Goldstein is now hailed as a hero by the State of Israel which erected a shrine to him in Kiryat Arba. Then there is the example of Irv Rubin, former head of the violent Jewish Defense League. Rubin was arrested in California in 2001 for plotting to blow up a Muslim mosque. Rubin later committed suicide in jail. Rubin is also hailed as a hero by Zionist Jews. Moreover, in recent days, a Jewish terrorist organization known as the Bat Ayin Terrorist Cell has carried out many “suicide missions” against Arab citizens in Israel. 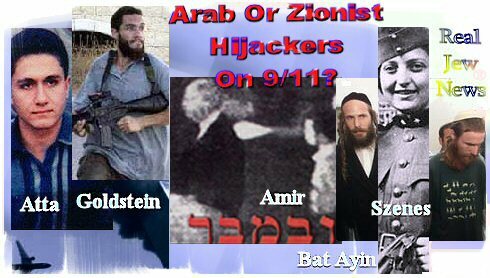 Were Zionist extremists flying those 9/11 airplanes? AN ISRAELI SECURITY COMPANY called ICTS International, owned by an Israeli, Ezra Harel, serviced all of the 9/11 airports. For some strange reason, video surveillance tapes of the passengers who boarded the 9/11 flights have not been used as evidence by the 9/11 Commission headed by the Zionist Jew, Philip Zelikow. The hijackers were said to be 19 Arabs. Yet none of the passenger lists revealed Arab names. Somehow or other these unlisted Arab “hijackers” boarded the planes at Logan, Newark, and Dulles airports. Then within only 48 hours of the 9/11 event the FBI provided a list & even photos of the Arab “hijackers.” But of the 19 “hijackers” it is now a known fact that at least 9 of them were never on those planes but remain alive to this day. On May 9 2008, Professor David Ray Griffin, author of 9-11 Contradictions, brought out a significant point about Mohamed Atta who was the alleged ringleader of the Arab “hijackers.” Griffen reported that Atta’s luggage never made it on board on American Airlines’ Boston Flight 11 even though there was almost an hour for the luggage to be loaded. 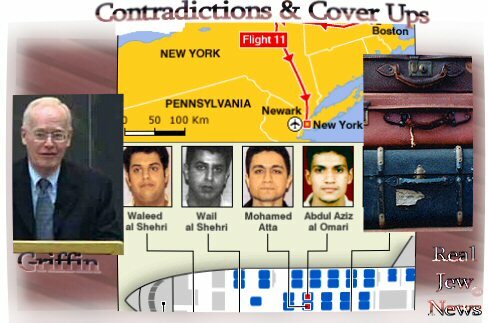 Atta’s luggage was used as “evidence” to prove that Arab “hijackers” took over the 9/11 planes. Found (rather “placed”) in Atta’s luggage was a copy of the Koran; an Islamic paradise wedding suit; a letter written by Atta that he planned to kill himself so that he could go to paradise as an Islamic martyr; and instructional videos for flying Boeing airliners Here & Here. Now here’s the rub. Atta’s alleged Mitsubishi rental car was “found” in Boston Logan Airport’s parking lot containing *yet another* copy of the Koran and *yet even more* instructional videos on flying Boeing airliners Here & Here. And not only this, but Atta’s passport was “found” unsinged from the World Trade Center’s inferno a few blocks away from the catastrophe – even though Atta’s name is not listed on American Airline’s passenger list. Methinks that a Zionist plot was behind it all. And Zionist “Suicide” Pilots Were The True “Ringleaders” Of The 9/11 Travesty.